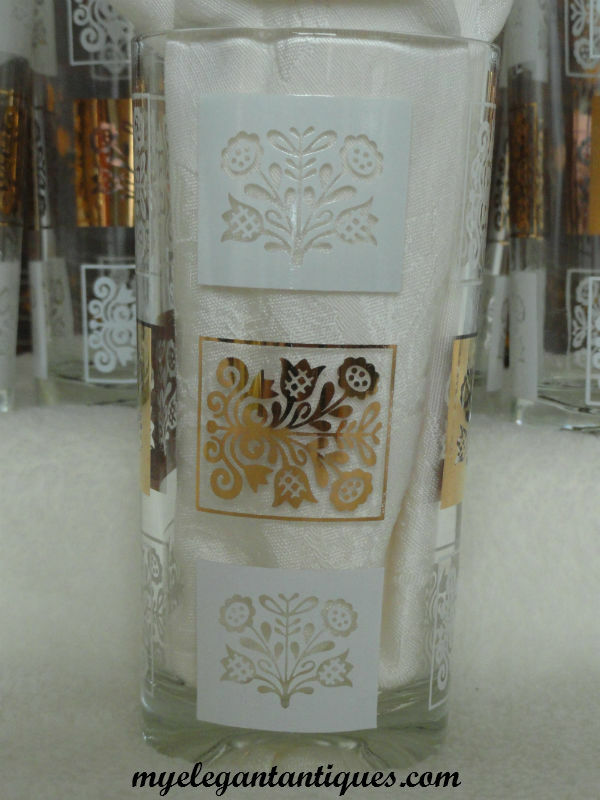 Our lovely set of 8 mid-century glass tumblers are embellished with a pattern of alternating white and shining gold squares set against clear glass. Inside each of the squares are beautifully decorated tulips and sunflowers on ornate stalks. 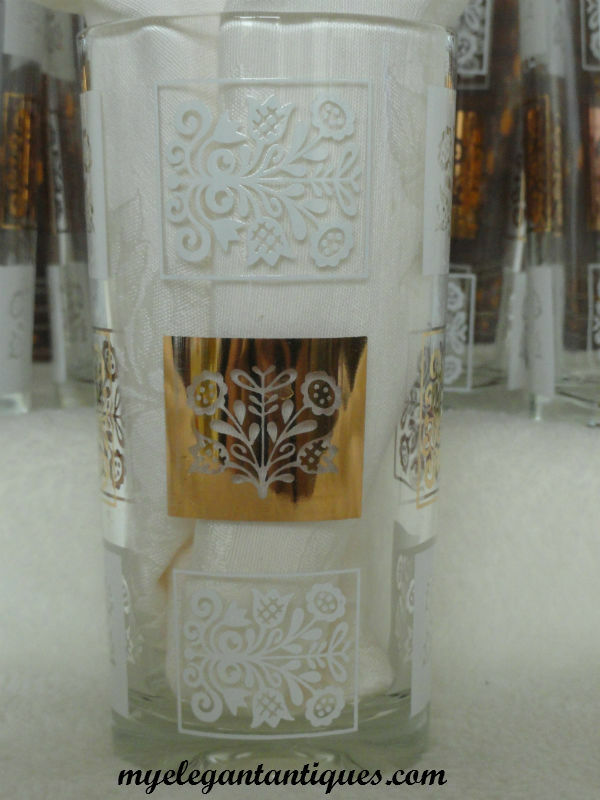 The rims of these glasses are also painted gold. 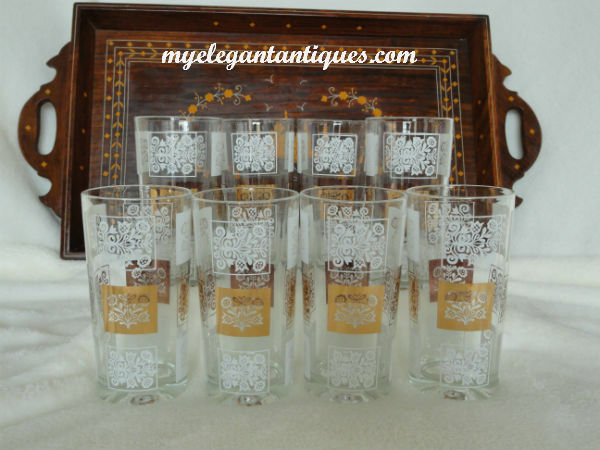 This particular set of glassware was manufactured in 1956 by the Continental Can Co., (the second largest producer of metal containers in America at that time) which purchased Hazel-Atlas Glass Co (the third largest producer of glass containers in the country at that time.) 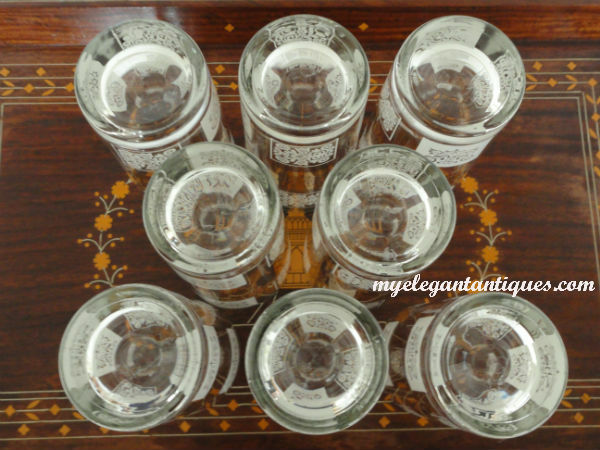 Continental Can Co.'s product line of glass tableware - which had originally been developed and manufactured by the Hazel-Atlas Glass Co - was commonly referred to as Hazelware. 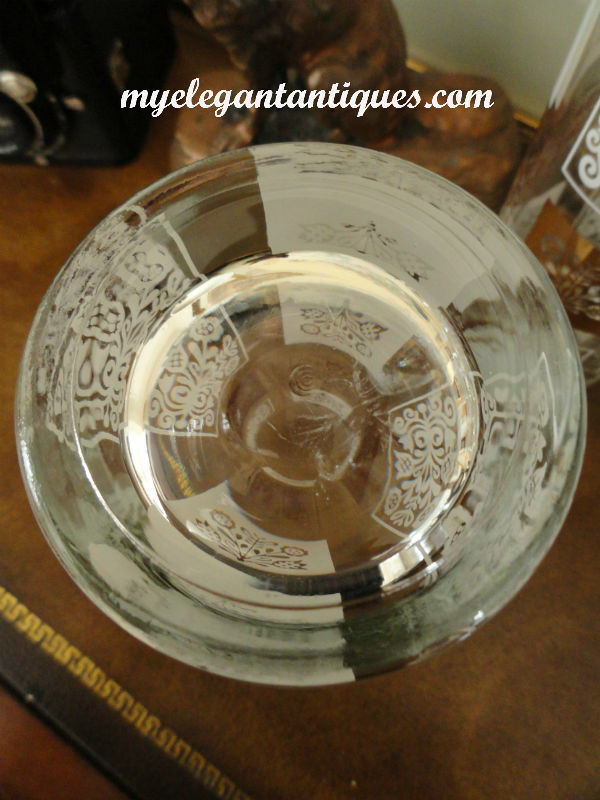 Hazelware was produced from the 1950’s to the 1970’s in Clarksburg, West Virginia. 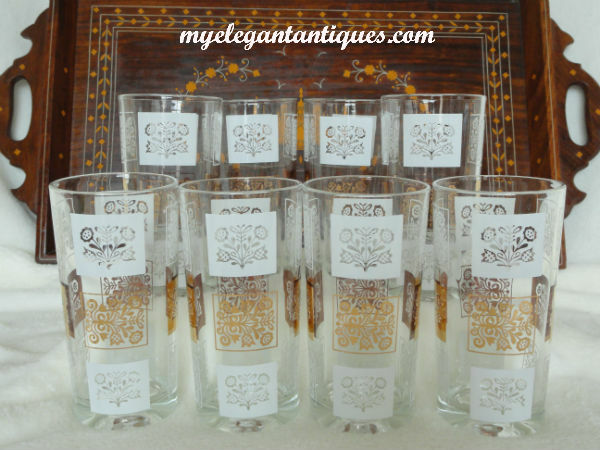 The CCC mark on the bottom of these vintage glasses dates their manufacture from between 1956 to 1964. 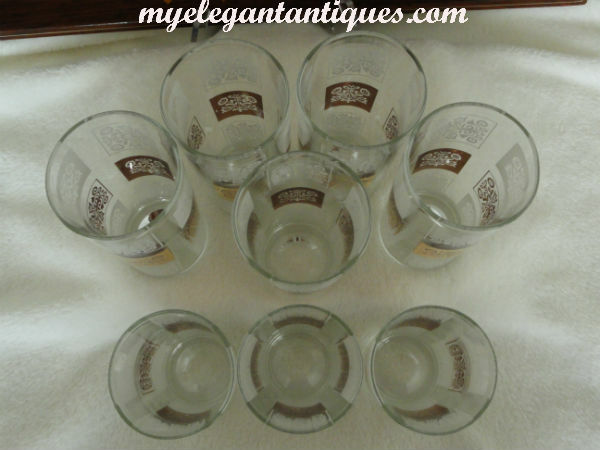 Measuring 5-1/2" tall and 2-3/4" wide at the rim, these glasses are in excellent vintage condition with no chips, cracks or loss to the pattern. There is minimal gold wear/loss to the rims consistent with their age. 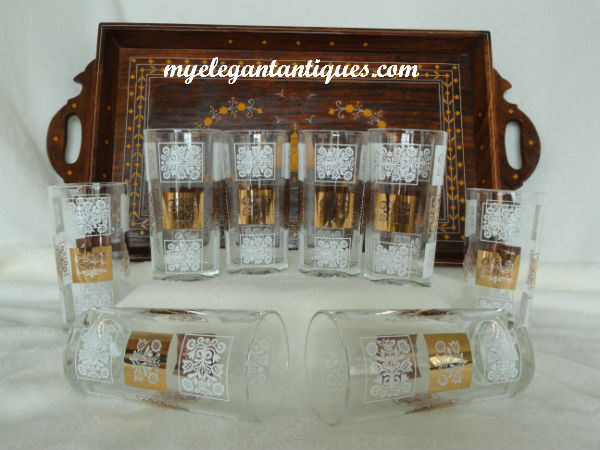 Please note that this listing is for the Set of 8 Continental Can Co. Hazelware Gold & White Checkered Tumblers, and not the lovely wooden tray pictured in the background.